It’s a pretty big deal for everyone involved. Let’s clear up any questions or concerns! Please note that Participants under 13 must have a parent or guardian register for them and must attend the entire event with them. High school students can and should seek guidance from Urban Engine staff and/or have a parent or guardian attend the event with them if they choose to stay at the venue. All younger participants are certainly invited to participate in the regular challenges in line with the Space Apps HSV Challenge. 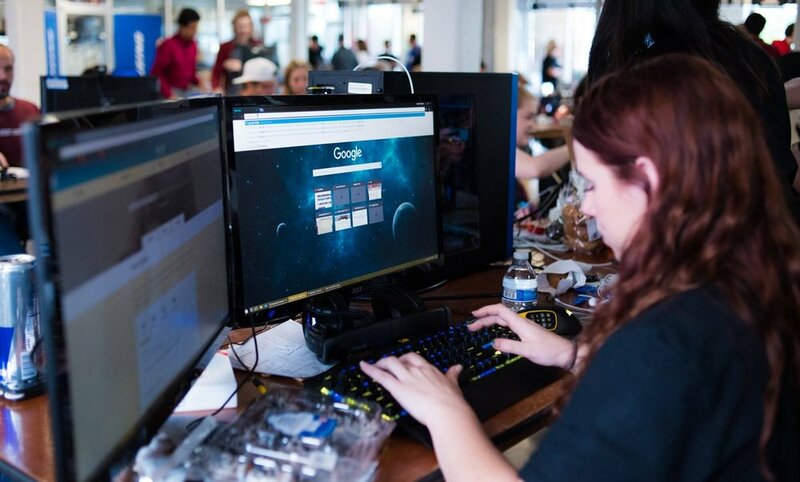 A hackathon is usually a 48 hour competition where Story tellers, Youtube Creators, Designers, Programmers, Project Managers, Subject Matter Experts, and Interface Builders come together to build and design something cool. The NASA Space Challenge is not only for STEM focused individuals, viewpoints that are scientific, technological, artistic or all three are encouraged. Space Apps HSV welcomes participants of all ages! We do not set a minimum age for participation in Space Apps, and many youth and children have participated in past events. High school students, college students and adults interested in taking on challenges are welcome! There are two categories of teams: high school and college/adult. You don’t have to be a member of a team to sign up. We’ll make sure to get you on one! How much do I have to pay to attend the Space Apps HSV hackathon? - It’s 100% FREE. In order for projects to qualify for judging and awards, every team needs to register and create a project page on spaceappschallenge.org. The project page must include a well defined description about the project, a link to the source code if it's an app, and must include a youtube video of the project's presentation and demo. We encourage teams to create their project page as soon as they form their team on Space Apps weekend, and to add project information as the weekend progresses. Why not? It’s a win- win situation!! Do High School students need to have programming experience? NOT AT ALL. 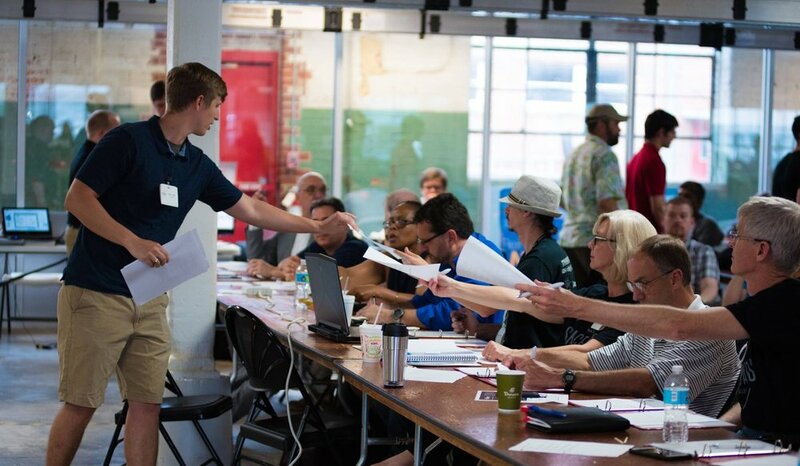 Space Apps is an annual event that pulls citizens together regardless of their background or skill level. Don't let the name fool you… it's not just about apps! Tackle a challenge using robotics, data visualization, hardware, design and many other specialties! Inspire each other while you learn and create using stories, code, design and, most of all, YOUR ideas. Show us your problem-solving skills and share your talents with the world! Do High School students receive any support? YES - 100% FREE. Technical mentorship is provided at no cost for students needing to understand complex aerospace challenges and breaking them down into approachable, creative solutions. Mentors will be available during and throughout the 48 hour event. Mentors will be provide technical direction, creative support, and professional guidance on critical thinking. So if your students attend the hackathon without knowing what they want to do, that will be fine because they will have mentors available to help and guide them. Note: Mentors will be “hands off” and cannot do the coding or building; however, they can assist with technical and project direction. How do I learn more before the event? How long do teams typically want to work each day? Some teams will prefer to work 4-8 hours per day, while others will want to stay up and work through most of the night during the hackathon. It is up to you to determine how long your team is willing to work each day. The Urban Engine staff will do whatever they can to accommodate both types of teams. At minimum, for Space Apps HSV weekend, the venue will be open for each full day with a full event schedule, including alternative space for teams who want to continue working after the venue closes for the business day. Can High Schoolers stay overnight for the event? No, high school students must depart by 11:30pm Saturday night and may return at 6:00am Sunday morning. Can people start working on the challenges as soon as they are published? We appreciate the enthusiasm of participants who want to start as early as possible, but we ask that participants start the actual work at the hackathon itself. The 48-hour hackathon is designed to inspire innovative ideas and develop solutions in a collaborative, team environment, and participants are not expected to have a fully developed project at the end. Having said that, the non-profit Urban Engine organization will provide many opportunities for attendees to meet and get to know each other before the hackathon, by holding a Pre-Event CoWorking Night™ workshops from September 12 - October 15 as well as featuring live Data Bootcamp Workshops during Kick Off Day (October 19). How can I support exciting projects post-hackathon? If you wish to support projects beyond the Space Apps weekend, the Space Apps Project Accelerator Toolkit can help you determine how to do so. The Toolkit provides some guidance on securing resources, selecting projects, and tracking progress. The Project Accelerator is NOT a required part of the Space Apps event, but is intended to be a resource for those who are interested. How many members should a team have? The sweet spot for teams is typically 4 to 5 people. If a team gets too big, it can be difficult for the team to focus; if it is too small, the team may not have all the skills/knowledge needed to solve a challenge. There is no set requirement or maximum number of participants per team, and we encourage you to be flexible and, wherever possible, to accommodate particular circumstances that may exist for you as a participant. Participants may start to form their project teams at (or before) one of the Space Apps CoWorking Night™ workshops, or teams may form or add additional members on the first day of the Space Apps event. Regardless of when teams form, participants are not permitted to start working on their solutions until the Space Apps event begins on October 20th. How do participants form teams? There are many ways that participants can form teams. Some participants may self-organize into teams before the event, or during the Urban Engine CoWorking Night™ workshop series, or on the Kick Off day during the Data Bootcamp sessions (Friday, October 19th). We’ve also created a special reddit thread for attendees to use to connect with others looking for teams. You are also more than welcome to arrive at the venue looking for a team to join! For this exact scenario, Urban Engine will facilitate team-building methods that have worked in the past. Does this mean only teams will compete or do you allow individuals as well? An individual is allowed to work and submit a project independently. However, we encourage all attendees to be part of a team! We have found that the most successful solutions come from teams of individuals with diverse skill sets and backgrounds. Urban Engine is building a community that is focused on creating an open and collaborative environment at your local Space Apps event. If participants come from a technical background, we definitely encourage you to connect with other participants like artists, entrepreneurs, or storytellers! If participants come from a non-technical background, we definitely encourage them to connect with developers, designers, and subject matter experts! Can teams work on more than one challenge? It can be very difficult for a team to do this successfully. Urban Engine strongly encourages participants and teams to focus on just one project and one solution, as the hackathon only lasts one 48 hour weekend! If a team feels that their solution is relevant to multiple challenge statements, we ask them to choose the challenge that is most aligned to their project. In order for projects to qualify for judging and awards, every team needs to register and create a project page on spaceappschallenge.org. The project page must include a well defined description about the project, a link to the source code if it's an app, and include a youtube video of the project's presentation and demo. We encourage teams to create their project page as soon as they form their team on Space Apps weekend, and to add project information as the weekend progresses. When will challenges be posted? Challenges will be posted on spaceappschallenge.org approximately one month before the event. Where will participants access the data for the challenges? Many of the challenge statements will include links to resources and datasets that are relevant to those challenges. Other data to use and explore will also be available from data.nasa.gov. Is it possible for a team to come up with their own project or is it mandatory to pick one of the challenges? We recommend you review all the challenges available! Your team can work on any challenge they choose. We encourage participants to develop projects in response to one of the challenges. In order to be eligible for global judging, teams must submit a solution to one of the official Space Apps challenges. However, participants who want to build a project that does not respond to a particular challenge are permitted to do so. Which hashtag should we use? The Space Apps Huntsville account will be using #SpaceAppsHSV and the Urban Engine account will be using #UrbanEngine. Please use this hashtag to let us know what you are up to! If you see a Flying Astronaut, any cool flyer selfies -- we would love to see you and maybe feature you on the global NASA broadcast! I still have a question. Who can I contact?